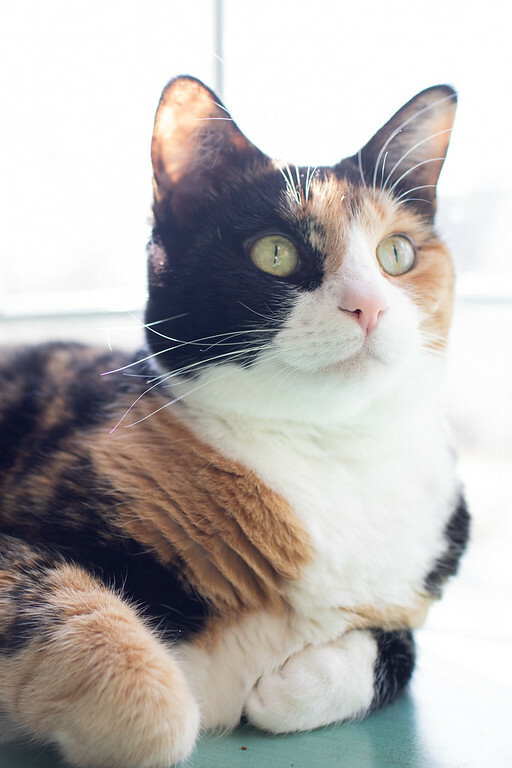 I’m back this week with a few new photos of Luxie kitty! I know I said that I needed to work on my backlog of kitty photos, her last two posts have been from when she was a kitten, Luxie Cat Playing and Luxie Kitty Grooming, but with the sunshine streaming in the windows, it was just too good to pass up. Now that the sun lasts so much longer, I’ve been taking my food photos on the dining room table – enjoying the afternoon light as it streams in our west facing window. 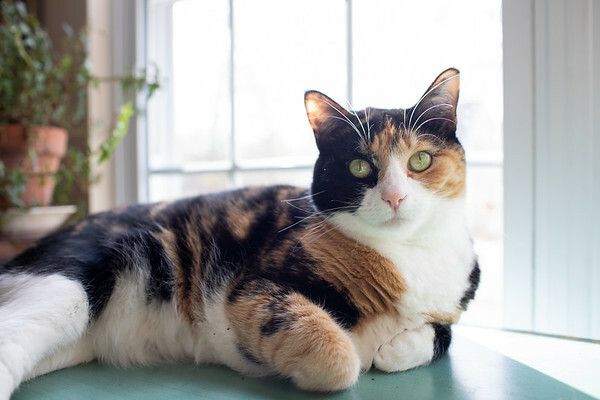 One of Luxie’s jobs is to supervise the food photography, and sitting on the table by the window is the perfect spot to supervise. You can see she takes her supervising job very seriously. I’ve been making a lot of new recipes lately, so she has had to work quite a bit. Some of you may have noticed some of my newer posts, focusing even more on healthy eating. We’ve been having lots of salads with homemade salad dressings and I’ve just discovered chia seed puddings! I’ve also just joined a gym! My husband had me on a family plan on another gym. That gym is great for him because he can go on the way to work. However, it’s 20 minutes from our house, so that’s a total of 40 minutes drive time (if traffic is good) and working from home, it was so much easier to just try and walk around the neighborhood or something. Well, I’ve joined a gym that is just about 3 minutes from our house! When they said that as a retired teacher, I could join for just $25 a month, I was hooked. I’ve been once and going back again today. I’m doing a basic upper body weight routine and then finishing off with elliptical or treadmill. I don’t do weight training for my legs, yoga and the cardio should keep them in shape. Anyone else have a good gym routine? 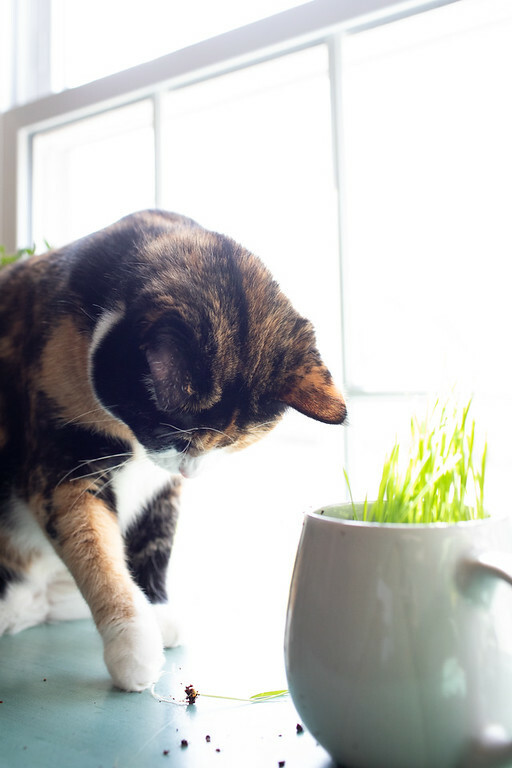 On another note, Luxie is back to pulling out her cat grass. She had stopped, but I think I put the grass out too soon. I usually let it grow fairly tall before I give it to her, which allows it to have deeper and stronger roots. I put this out too early and she has pulled nearly half of it out! For my artsy photo this week I used Topaz Labs. Wow your filter is amazing.! It looks so vivid and vibrant. I used your helpful quote in our Cat Close-up Post it was SO helpful for me figuring out f-stops!! Luxie, you look gorgeous as always. Mom’s idea of exercise is to take the dogs for a walk. Which when she takes them to the beach and walks with Mrs. Tammy is a pretty good work out as they try for at least 3 miles and aim for 5. Here at the house it just around the pond which isn’t very far at all although Mom does try to go fast so she can keep up with Fenris. Hooray for a gym 3 minutes from home! It’s hard enough to go; wasting all that time driving would really leave me unmotivated. I’ve already been 3 times, I love it! Luxie is such a beautiful supervisor and those pretty furs always make us smile. Thanks for joining the Thankful Thursday Blog Hop! Still such a beautiful kitty. Mom doesn’t go to the gym. She says she has joined so many times and never goes. If she can’t work out from home, forget it. Glad the gym is good for you. And a great supervisor she is! Great shots. Love the artsy photo. Luxie is so pretty, I love her colorings. Kuddos to you for going to the gym. I have no motivation. I do a bit of yoga every day and Athena loves to join in sometimes! It is always such a joy to see precious Luxie – whether old or new photos, she is such a doll. The artsy effect is so pretty. I like the unaltered photos too. The natural light from the days getting longer make such a difference. I had a look at your Chocolate Chia seed pudding. That sounds so delicious and couldn’t be easier to make. I always have chia seeds but usually only sprinkle them over my fresh fruit I have for breakfast, or over granola. It’s definitely on the agenda for tomorrow! You’ll have to let me know what you think! I have some other ideas for more chia puddings in the works! I made it and it was delicious! Hubby loved it too so it will be reappearing at regular intervals.